Whilst doing these Play Your Part experiments, I often imagine I’m wearing a white coat and blowing things up in the lab. Fortunately for our visitors and collections, I’ve not been let loose with any chemicals yet, so you’re all safe (for now… *evil laugh*). Science at school wasn’t very hands on, but I can imagine that proper scientists have experiments that succeed and many that fail (and some that have unexpected results). Whilst not a catastrophic failure, Part 4 of Experiment #1 was a bit of a damp squib. 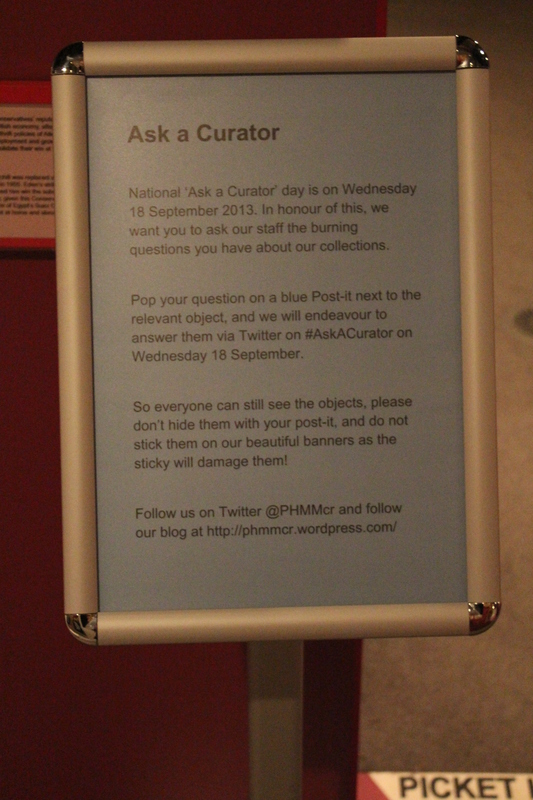 The aim was to encourage visitors to engage directly with the collections, right in the galleries. 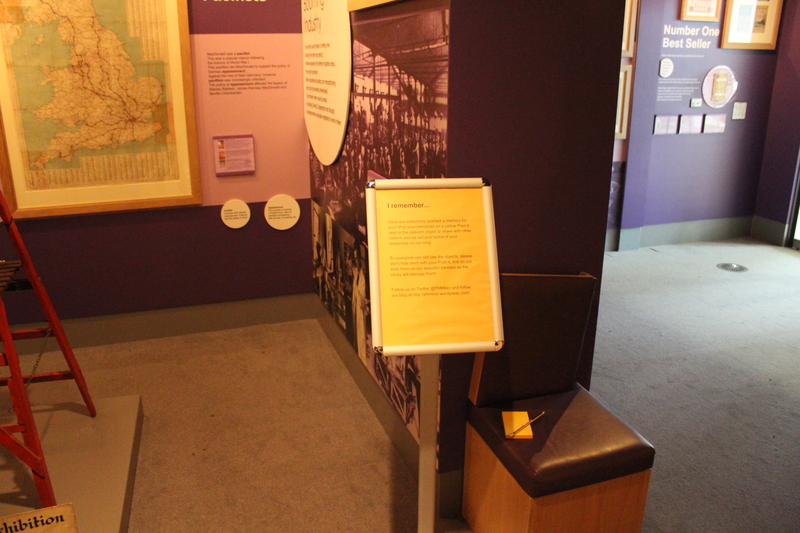 We placed six instruction signs (three in each gallery), colour coded post it notes and pencils throughout the galleries and asked our visitors to ‘Ask a Curator’, tell us their inspirational objects and share any memories sparked by the collections. So everyone can still see the objects, please don’t hide them with your post-it, and do not stick them on our beautiful banners as the sticky will damage them! We didn’t need to be so worried. The results of the experiment showed that our visitors were reluctant to post their comments directly in the galleries and we only received a light smattering of responses. This was in contrast to the results of previous experiments when we got a larger response. Halfway through the experiment we moved the signs outside the galleries to see if this made a difference. We thought that if the visitors saw the signs before they went in, the questions would be in their minds when they encountered the objects, and they would be more likely to respond. Unfortunately this didn’t seem to have any discernible difference. Over the course of the experiment we logged 26 post its: 5 blue ‘Ask a Curator’ questions, 12 green ‘I like this because’ and 9 yellow ‘I remember’. The responses we did get were very engaged with the collections and well thought out. They included a detailed answer in Spanish next to the Chile Solidarity Campaign banner, which translates as ‘Thanks for the solidarity with can always fight the people of Chile. Thanks for helping to overthrow the dictatorship. “Workers of the World Unite”’. Whilst the responses were limited, the experiment definitely drew out quality over quantity. Surprisingly, there were no post its mentioning the allure of One Direction, or just visitors signing their names, although there was the hilarious, ‘I stole a loaf of bread. Sorry – John Valjean’ in the Co-op shop. 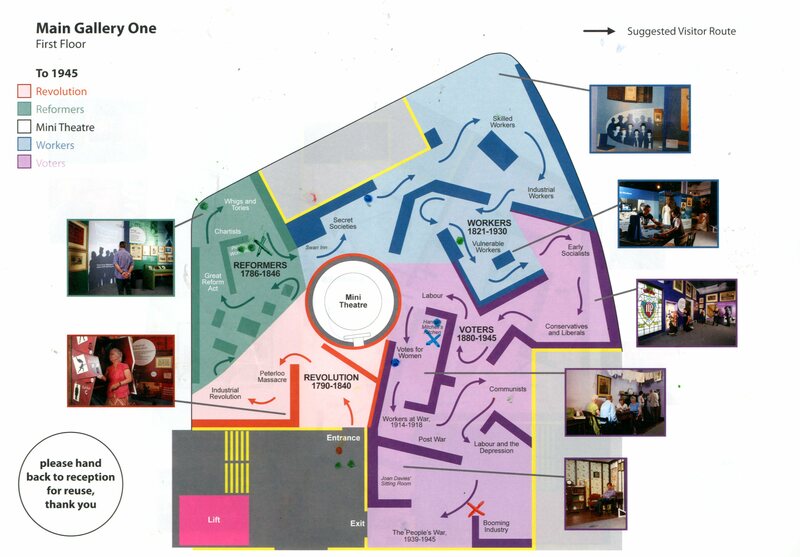 This does have implications of how we’re going to take the project forward. 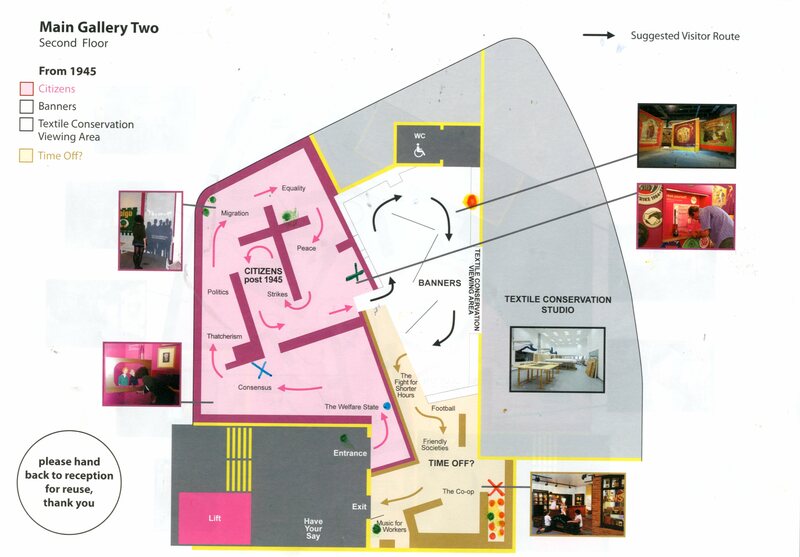 We are in the process of tentatively developing a similar system, which is more high tech, for visitors to comment on objects, both online and onsite. I am concerned that this experiment shows that there may be a lack of take up, however the comments did show a level of engagement on a deeper level than some of the previous experiments we’ve done. The next step will to embrace my inner scientist and carry on testing! 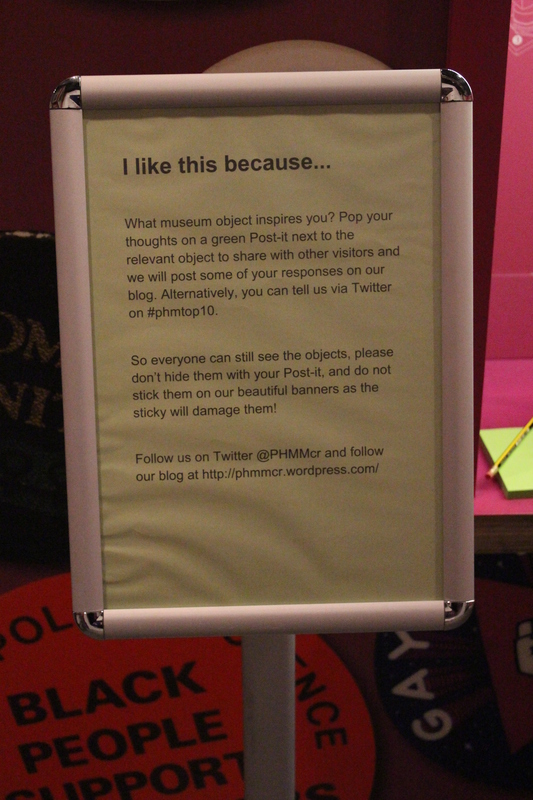 This entry was posted in People's History Museum, PHM Collection, Play Your Part, Research and tagged Chile, Experiment, Experiment #1, People's History Museum, Play Your Part, Post-it note, Research, The Co-operative. Bookmark the permalink.